Alexander was born c. 20 January 1887 in the Demesne, Longford. Alexander later moved to North Americia where he worked as a hotel clerk. Pte Moorhead enlisted with the Canadian Expeditionary Force in April 1915 in Calgary. Moorhead served fpr a number of months in France and Belgium from August 1916. He was discharged from the army on 31 July 1918 at Valcartier, on medical grounds (pulmonary thrombosis, originating in the trenches). During his service he suffered repeatedly from bronchitis and pulmonary tuberculosis, leading to recouperation in field hospitals, and then military hospitals in England before transferral to a convalescence home in Canada. On the 14 January 1919 in Balfour, Britsih Columbia. Alexander married Ruth Rose Johnson, from over the border in Washington State. Alexander died near Wetaskiwin, Edmonton, Alberta. His death was not attributed to his war service, although the military doctors gave three years as an estimated span of the illness. 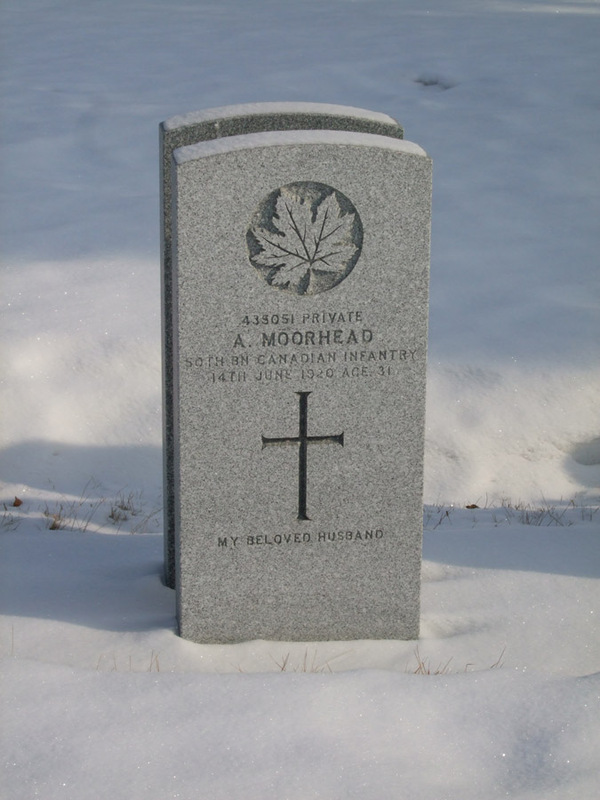 Pte Moorhead was the brother of Sgt Henry Moorehead, who also died as a result of the Great War. Alexanders other brothers, George, William and Alfred also served in WW1. Son of William George Moorhead and Emily Harriett (née Jones) of Demense, Longford. 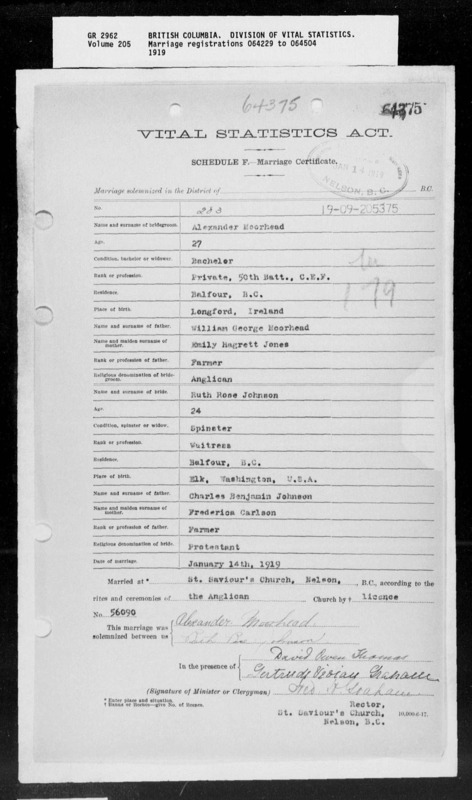 *It is probable that this is Ruth Rose Johnson, who married an Alexander Moorhead on 14 January 1919 at Nelson, British Columbia, not far from the border with Washington.